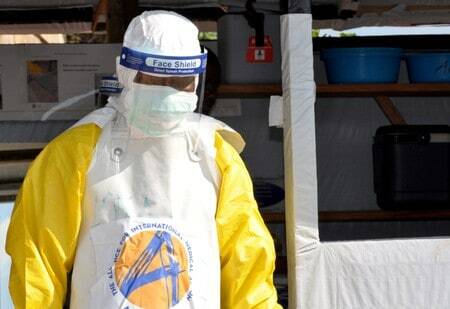 GENEVA (Reuters) – The World Health Organization (WHO) said on Tuesday an Ebola outbreak in northeastern Democratic Republic of Congo could worsen rapidly because of attacks by armed groups, community resistance and the geographic spread of the disease. “We are now extremely concerned that several factors may be coming together over the next weeks and months to create a potential perfect storm,” the WHO’s head of emergency response, Peter Salama, told a news conference in Geneva. The response is at a critical juncture and, although the weekly number of new cases has fallen from about 40 to about 10 in the past few weeks and more than 11,700 people have been vaccinated, major obstacles remain ahead, Salama said. Attacks by armed opposition groups have increased in severity and frequency, especially those attributed to the Alliance of Democratic Forces, most dramatically an attack that killed 21 in the city of Beni, where WHO’s operation is based. The city has declared a “ville morte”, a period of mourning until at least Friday, obliging WHO to suspend its operations. Overnight on Monday, unidentified assailants entered the town of Oïcha, about 20 km (12 miles) north of Beni, burned houses, killed one man and kidnapped 14 children and one woman, according to two local officials. Oicha has two confirmed cases of the virus and one probable case. On Monday 80 percent of Ebola contacts — people at risk of developing the disease and so requiring monitoring — and three suspected cases in and around Beni could not be reached for disease monitoring. Some people were fleeing into the forest to escape Ebola follow-up treatment and checks, sometimes moving hundreds of kilometers, he said. Neighboring Uganda was now facing an “imminent threat”, and social media posts were conflating Ebola with criticism of the DRC government and the United Nations and “a range of conspiracy theories”, which could put healthworkers at risk.